Perhaps more than any other group, the words of a politician are paid great heed by the public. But, when listening to a politician’s speech, are his or her words the only thing being absorbed by the mind? Psychologists say that politicians can never totally get away with lying to the public because of body language. No matter how much training a politician receives on public speaking, he or she can never really suppress small hand and facial gestures that give away true feelings, even if his or her words don’t match those gestures. Dr. Peter Collett said at the British Association’s Science Festival that “Nobody can escape the eye of the psychiatrist,” meaning that it is impossible for anyone to suppress all unintentional behaviours. 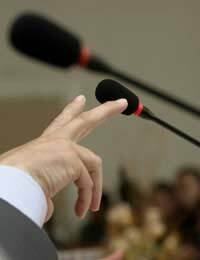 While politicians may be more disciplined to control their body movements during a speech or press conference, their tiny gestures are compared to that of a poker player. Being a successful poker player relies heavily on the ability to stifle emotion. If a player has a very strong hand, he or she needs to act the same as if he or she has a weak hand. This is so the opponents cannot tell anything about the cards the players are holding. However, even the best poker player may have a small gesture that gives his or her hand away. This gesture, known as a tell, can be something as small as a bite of the lip, the movement of an eyebrow, or fingers rubbing slightly together. The same is true of a politician. Not matter how poised he or she is while giving a speech, certain tells can give away their true feelings about something despite what their mouth is saying. For example, some at the Science Festival have picked up on the fact that former British Prime Minister Tony Blair would fiddle with his little finger when anxious while others note that he may touch his stomach when under verbal attack. Former U.S. President George Bush often bit the inside of his cheek when he felt anxious during a speech or press conference. Dr. Collett noted that in general, politicians who stare out into the distance during another’s speech is subliminally telling the audience that he or she doesn’t think the person speaking deserves his or her attention. Even a smile can give away a politician’s true feelings. A real smile raises upward said Dr. Collett, as opposed to a forced or grimaced smile. Some politicians understand the effect of body language on the public and may try to use it to their advantage. Former U.S. President Bill Clinton often bit his lip when trying to appear emotional, such as when he apologized for the affair with Monica Lewinsky. Did that small gesture win him the public’s sympathy? Dr. Collett also noted that George Bush walked with his palms facing the rear, a stance that gives the appearance that he is physically larger than he actually is. Can body language alone affect the public’s views? Robert M. Teeter, a pollster for the U.S. Republican party, conducted a survey of two groups of ten and twelve people to see what effect body language could have on a person. As part of the survey, the people saw a brief video of politicians with which they were not familiar. There was no sound on the video, so the people in the study had no idea of the politician’s views, but the video did show the politicians shaking hands while campaigning. When asked if they felt the politicians were honest, Teeter told David Burnham of the New York Times that those in the study rated politicians they didn’t know just as if they actually did know their positions on views, based solely on body language. While some politicians may be able to sway people with sympathetic body language, Professor Geoffrey Beattie of the University of Manchester says that if the politician is lying, eventually he or she will be exposed as a phony. Professor Beattie notes that you can’t fake a genuine smile because it is too difficult. Next time a politician is on stage, take in not only his or her words, but actions while speaking as well.